Built to fit the way you farm from your smaller to your larger farms. This Case IH Magnum Series tractors are the ultimate mix of the industry leading horsepower and fuel efficiency. Available in wheel or track configurations with a horsepower range from 180 to 380. With today's implements continueing to ask more from you and your tractor. 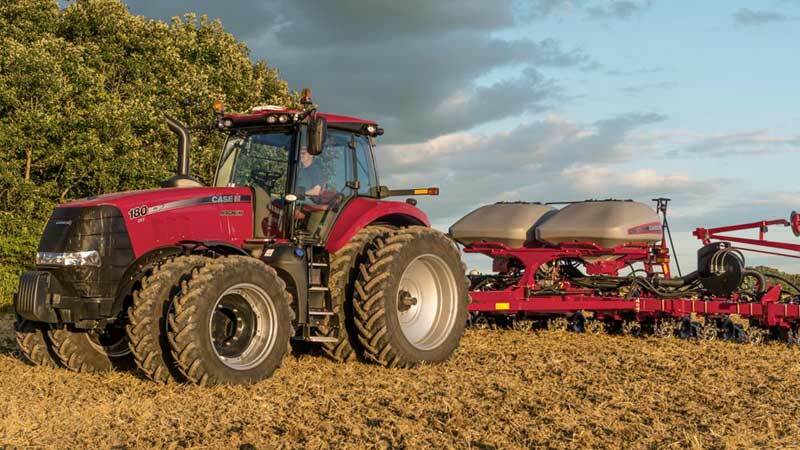 With Case IH innovative technologies to give you more power, more efficiency and a better operator experience. With the optional Track design you will achieve better flotation, improved maneuvering and more flexibility. No one tractor solution can fit every grower's needs. But if you're a row crop producer in a region with challenging soil types, putting tracks on the ground could be your best option for infield power. Magnum Rowtrac tractors are designed to strike the perfect balance, with tire options that fit your row width and soil type and an oscillating rear track design that keeps the power on the ground through the tightest turns. These tractors keep four point of ground contact, which reduces surface pressure and means less weight transfer from front to rear than two track systems. It offers a new meaning to maneuverability and handling comparable to a wheeled tractor.